In areas with landslide risk involved – embankments, steep slopes –, where the root cause of the movement is the increased groundwater level, we apply drilled (deep) drainage technology. uses trenchless horizontal directional drilling technology. Firstly we investigate the soaked aquiferous soil layers and define their depth by geological exploratory borings. Secondly, we install heavy duty, self-cleaning drainpipes in these soil layers. Groundwater or aquiferous water collected by these drainpipes flows into a drainage collector shaft, from where the water can be evacuated to a closed collector line or to a receiving water body (sewer system, waterflow, etc.). 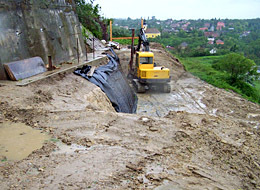 Drainage systems constructed as described above can result a considerable – even 3-4 m – of groundwater level decrease already during the construction phase in areas with risk of landslide involved, eliminating the root cause of the movement (embankment protection, slope stabilization). Enhancing this drainage construction method, we invented the technology of gravitational drainage system with radial gravel body wells (technology patented by Sycons Kft. ), as a new, even more efficient method of posterior dewatering. 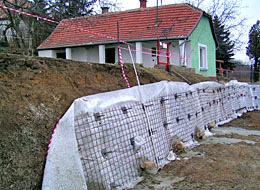 The essential element of this new method is the gravel body well, which consists of a vertical gravel column (gravel body) that collects the groundwater and aquiferous water present in the different soil layers, and evacuates the collected water into the drainpipes connecting the gravel bodies at the bottom level. A system can include more than one gravel column. These gravel columns generally consist of dia. 20-60 cm vertical drainage bodies, in function of the local characteristics. When constructing the radial system, firstly the gravel columns are installed, and the drainpipes connecting them are constructed after that. Using the horizontal directional drilling technology, up to 100-150 m long drains can be installed. In these cases where this solution cannot be applied for some external reasons (e.g. motorways or railways in a deep cutting, or in case of high voltage underground cables), we use a drilling-jacking technology with temporary steel pipes to install the drainpipes. Plastic pipes used as drainpipes are made with 0.1 or 0.2 mm wide gaps, the section of which broadens towards the inner surface of the pipes, thus, when installed in permeable soils, clogging of these pipes is virtually excluded. In case of regular maintenance, their expected life span is at least 50 years. The execution requires only a minimum of earthworks, even in case of important depths. As further reinforcement, we use drilled injected anchors. If the project requires, we can also construct so-called gabion walls (protective walls made of stone cages), for example for protecting dam toes stabilized by drainage systems against surf. The aesthetic, environment-friendly gabion retaining walls are integrated in the natural landscape.